On a recent night out at a tony and cosmopolitan downtown restaurant, our group was treated to a delightful cocktail served in a Mason jar that cost 12 hard-earned dollars. It was a rhubarb spritzer with cucumber, lime, and vermouth, and it was delicious—if not for the barbershop pole-patterned paper straw that came with it. Aesthetically, it screamed to be “liked” on Instagram. But practically, the paper straw made the drink a few degrees less pleasurable. This inspired a conversation during The Takeout’s morning meeting about the merits of alternative straws—that is, straws not made of plastic. On one side: Plastic straws are destroying the planet. On the other: Paper and metal straws feel inferior. Where do you fall on this very first-world argument? I’m probably not going to volunteer for Greenpeace or install a wind farm on my roof any time soon, so I welcome the small, everyday measures I can take to maybe save this hunk of floating space rock we call home. I’ll recycle, ride my bike instead of driving, and sure, I’ll forgo a plastic straw. It seems like a relatively simple swap that makes a small different in the amount of plastic crap humans send to landfills, a.k.a. the ocean. Cardboard straws are a fine alternative for sodas and lemonades and the like. When a café I frequented started using them a few years ago, I actually thought they were whimsical in a burlap-and-Pinterest sort of way. The papery feeling takes a bit of getting used to, but after a few weeks’ worth of sodas or lemonades, I doubt we’d still be hung up on the texture. 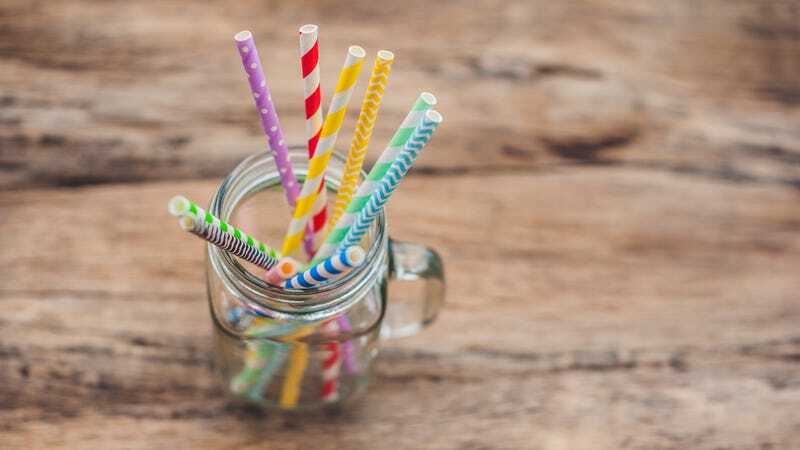 Metal straws are a reusable option, especially for cocktails and iced coffees, and I’m fine with that, too. A highball glass with a metal straw is actually pretty classy, if you ask me, much more so than a cheap, disposable plastic straw. Given some of the more involved solutions proposed to save our environment—carbon sequestration, scaleable alternative energies—just swapping out a straw’s material seems super simple. If the cardboard texture bothers you, maybe just sip from the cup directly instead? First, allow me to present my environmental bona fides: I grew up in Seattle (liberals! ), was a member of the Boy Scouts (we love the outdoors! ), and live my adult life as an active recycler (in a city that doesn’t give two shits about recycling). I can empathize with the scourge plastic straws have been on our landfills and oceans. Paper straws have a strange tactile sensation. It’s non-pliably stiff and begins to degrade into shreds within minutes in your drink. Metal straws suffer from the same fate—every time I’m given one, it conjures up a trip to the dental office, with cold metal instruments clanging around my teeth. I end up ditching the straw—as Kate suggested—and drinking out of the glass. Stop buying bottled water, opting for a Nalgene bottle instead. Stop using plastic bags when I shop in the produce section, since I’m going to wash my fruits and vegetables at home anyway. In exchange, let me keep using plastic straws until I’m a big boy and get used to paper and metal straws.